Every year, I grow our beans on a trellis net perched above one of our beds. You can see a photo of our typical setup here on the blog. 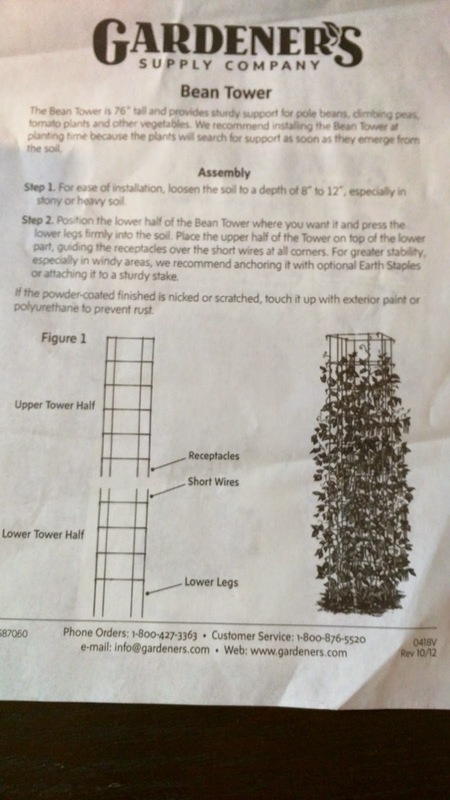 But this year, I was gifted something new for my birthday: a Bean Tower from Gardener's Supply. Taking a photo of the Tower without any growth on it is kinda hard, so I took this ratty photo (below) of the instructions/details. We've already picked out the bean seeds, but because I still have to get a new thin layer of compost on the top of our beds, we still haven't planted them yet. Grow bushels of beans with our tallest, strongest and sturdiest bean trellis tower yet. The secret is thicker supports coupled with 10" legs that hold the structure securely in the ground. The Bean Tower in our test garden yielded 2,400 beans between mid-July and late September — in just 1-1/2 square feet! Supports are 5 mm thick with 3.5 mm crosspieces. Openings are 7-1/2" square to allow easy harvesting. In windy locations, we recommend anchoring with our Extra-Tall Earth Staples.